More of a reminder to myself that many of you can probably relate to. My ‘wee’ bit of a rant was inspired after I spent a couple hours yesterday afternoon learning. Or better yet, going through a course I own. How many times have you bought a course, started it, then never went back to finish it? Rant: Take the time to go through the courses you purchase an own. End rant. This doesn’t happen as often as it used to mainly because I don’t buy a lot of courses. The only time I purchase a course is if it’s relative to what I’m focusing on at the time. Right now it’s more about me implementing than learning. As an example, at the end of last month, I wrapped up my first beta round of my Content Strategy Workshop (I’m still working on a better name). It was an awesome group of people and they gave me invaluable feedback. I have Troy Dean’s Rockstar Empires course (a course on courses). I started going through it a while ago but wanted to do what Troy recommended I do when we hung out last summer. Launch it, get the validation, ask for feedback, then rinse & repeat (at least a couple times). Now that I did that, it’s time to jump back into his course. So that’s what I did yesterday afternoon. I’ve already been breaking things down but wanted to map everything out before I started recording videos. I blocked off yesterday afternoon and dove in. As you do this process, you get clearer and clearer about your own work. In this case, it’s my Content Strategy course. Going through the steps and working through it as I went got me more and more excited about what I’m doing. I could also see where I needed to dive deeper in certain areas. I ran the course as a 4-week course with live webinars each time. 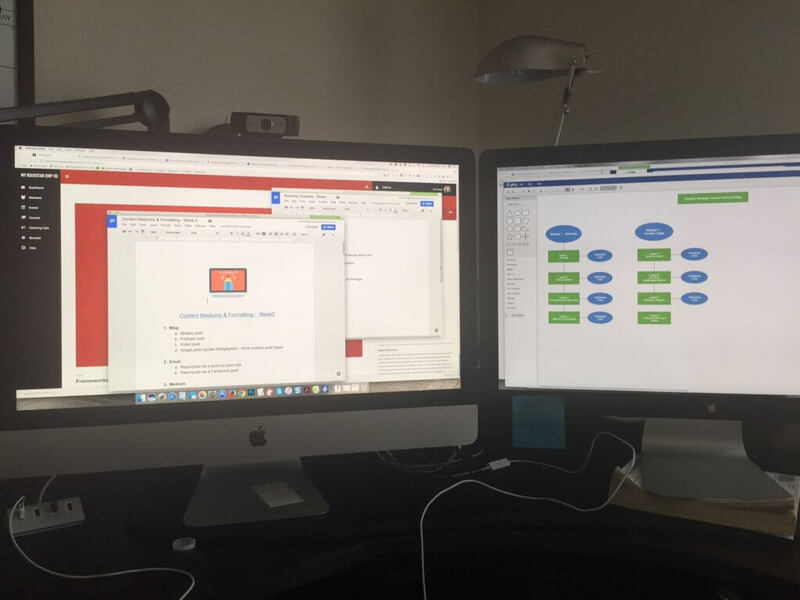 The monitor on the right shows how I’m going to break down week one into EIGHT lessons! That’s how invaluable actually going through the courses you purchase can be. Sometimes you may choose to invest in a course because it’s a great price and you know you will need it, but not immediately. Go back to it and implement. Sometimes it may feel like taking the time to go through courses isn’t ‘work’… but that’s why we do what we do, right? THIS is the work we’ve chosen. You taking the time to learn and create is doing the work. I’ll be opening up the Content Strategy Workshop again in a couple weeks. I’m still calling this a beta of the course because I’m going to keep refining it. Ideally, this will be a ‘signature’ course for me, but I’m going to nurture it and test it a couple more times. In the meantime, I wanted to share a great post and download with you today from my friend Coleen Stanley (who was also a student in my workshop). Coleen is an instructional designer and has been in the online education space for 14 years. Coleen shows you how you can pre-sell and beta test your course online before you launch it. I know there are a lot of courses on courses (I have more than Troy Dean’s course). I also know different people have different teaching styles and some may resonate more than others. This is a great way to dip your toes into the idea of creating your first course (which by the way I think we all should have our own courses, but that’s for another day). Read 8 Easy (and Inexpensive) Steps to PreSelling and Beta Testing Your Online Course here.